Perhaps the most underdeveloped, and underestimated, regions of Costa Rica is it’s northeastern Caribbean Coast. Unlike it’s Pacific counterpart, the Caribbean Coast of Costa Rica is not known for it’s tourist friendly swimming beaches or luxury hotels. The draw is the unspoiled and unaltered flora and fauna, which has drawn eco-travelers and nature lovers for decades. 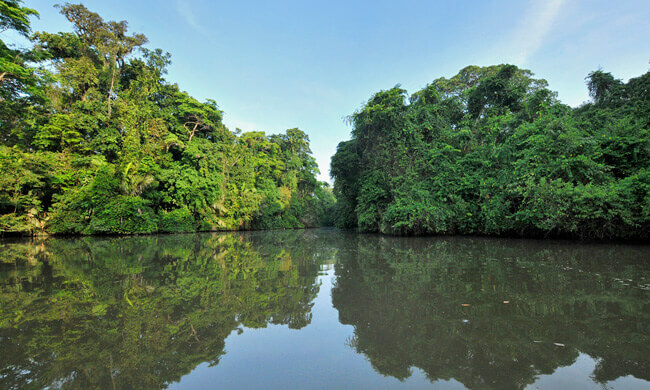 Together the Tortuguero National Park and the Barra del Colorado Nature Reserve to the north make up one of the largest virgin lowland rainforests in the world. It may feel like you did more time travel than international travel after spending a few days in what is often referred to as the ‘Venice of Costa Rica’. While it is certainly not as built up or developed as its Italian counterpart, once you arrive it is very easy to see how it got that nickname. Accessible only by small plane or boat, fresh water canals take the place of roads while banana boats replace cars. In recent years internet and air-conditioning has made its way into the area, but raw nature still dominates creature comforts in this corner of Costa Rica. Certainly one of the reasons this is a protected area and part of the reason it is so popular is the sea turtles that return here every year to nest. Four different types of turtles nest here each year – the hawksbill, loggerhead, green turtle, and the huge leatherbacks. In addition to the huge assortment of monkeys, birds, snakes and frogs that are also found here, it is a very common site to see crocodiles sunning themselves along the banks of the canals. The combination of all this wildlife, untouched rainforest, quiet freshwater canals, unexplored lagoons, and the open Caribbean Sea makes for an exotic and wild fishing destination. Without a doubt the main attraction for anglers heading to the Caribbean Coast of Costa Rica is the huge tarpon that are found here. Appropriately named the ‘silver king’, these beasts average 100-120 lbs and can reach mammoth proportions of over 200 lbs! Besides their sheer size, what makes these fish a favorite among sport fisherman is their strength and fighting ability. A tarpon may actually be the most difficult game fish to boat because the fight can last for hours and they are experts at throwing hooks. Extremely hard runs and spectacular jumps of 6-7 ft into the air are what make tarpon fishing so popular. Tarpon are found in the fresh water canals and rivers as well as in the Caribbean Sea near river mouths and reefs. The backwater lagoons also offer a serene fishing setting as you can find machaca, mojarra, and the delicious guapote (rainbow bass) as you listen to the sounds of the rain forest. In-shore fishing is always exciting as you will find big snook, snapper, jacks, and kingfish in the river mouths or within a few miles of shore. Of course if you are looking for something different or just prefer off-shore fishing, with a quick 40 minute run you can be fishing for tuna, wahoo, dorado, and sailfish out in the Caribbean.